Costa Rica Expeditions / What to pack for white water rafting? The most comfortable clothing to wear on the river is a pair of shorts which are not too short so that they’re not hiking up on you all day, a quick drying t-shirt (rashguards for surfing are a great option) and shoes that strap onto your feet. Your shoes can be tennis shoes (they’ll get wet) or river sandals. A swimsuit under your clothing is an optional choice some people prefer. It is very important to bring sun block as you’ll be in the sun and in the water all day. If you wear glasses either prescription or sunglasses you’ll want to have croakies or a strap of some sort to secure them to you head. For after the river, you need to bring a day pack that will stay on the bus. In this day pack you’ll need: a full set of dry clothes to change into after the river, a plastic bag for your wet clothes, a wind breaker, sweat shirt or light weight jacket and a towel. You may also choose to bring a very small amount of cash for a beer or soda at the take out. For the overnight Pacuare River trip on the Costa Rica River and Rain Forest Adventure participants will need to pack three groups of “stuff”. The first set will be river gear which will be worn in the raft and will be wet the whole trip. The second set of “stuff” will be dry clothes to wear at camp as well as personal toiletries needed for the night at camp. The third group of “stuff” will be left on the bus so that participants will have clean, dry and warm clothes at take out. Please be sure to take with you on the river only those things that are truly needed. 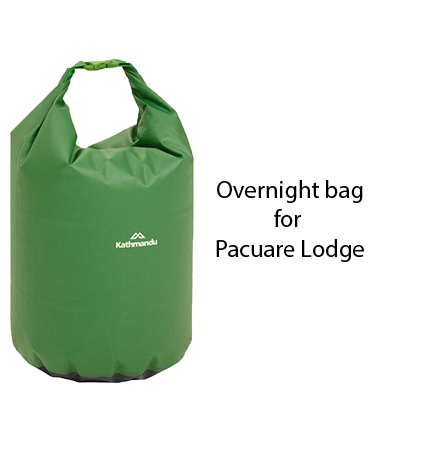 Each person will receive one dry bag to accommodate his/her belongings. Bags over the size or weight allowance will not be transported to the lodge. If you are returning to San José and your drop off point is the same hotel as your pick up then please store your extra luggage at that hotel. In case you are not traveling back to San José we will gladly store the rest of your luggage in our warehouse in Siquirres during your tour.